The season’s 7th tropical storm formed late yesterday. Tropical Storm Grace is well east in the tropical atlantic and has become better organized overnight with a well defined circulation and top winsd are now at 45 mph though the National Hurricane Center says this may be conservative. Conditions over the next 2 days remain favorable for strengtheing and it is possible that Grace could reach hurriane strength during this period. 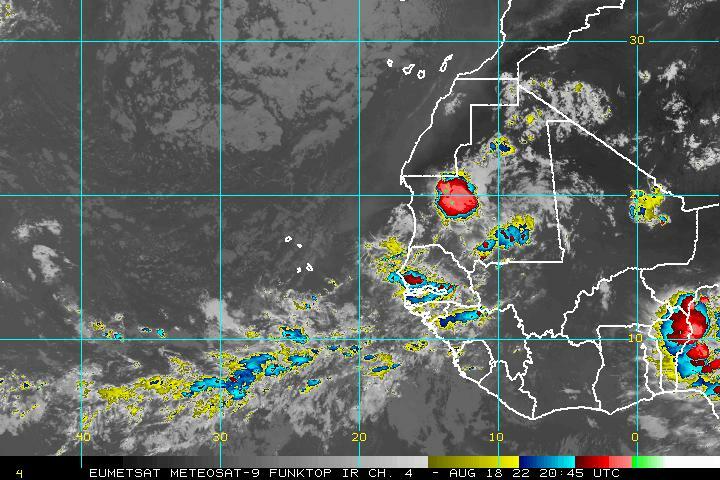 To the northwest of Grace is Tropical Depression Fred which has flared up again overnight and Fred might become a tropical storm again as it meanders over the ocean. The National Hurricane Center track follows the idea that this depression could initially strengthen before weakening due to shearing. The lack of development would also favor a more westerly course as the system responds more to winds in the lower atmosphere then the winds in the upper atmosphere were it to be a deeper tropical storm or hurricane. As far as the longer term pattern across the Central Atlantic it remains unchanged. Looking at the satellite loop we continue to see what we have seen for weeks. Strong upper lows dominate the low across the central Atlantic which create hostile conditions aloft for Grace once it gets west of 40-45 degrees west. Models do not show that pattern changing anytime soon so Grace could meet the same fate as Danny and Erika and get sheared apart. To get a better understanding of what the environment for Grace is take a look here at the wind shear that is forecast for the higher levels of the atmosphere in 3 days and the 5 day average. The map above shows the average shear (increasing winds as you increase in height) and the forecast shear pattern in 72 hours (Wednesday morning. Grace will be moving right into that area of 40 knot plus shear which will rip it apart. These shear conditions have been pretty much in place for the last month. That shearing environment extends almost down to 10 degrees north so even if Grace were to move straight west from here it would move into the southern area of that shearing environment. Longer term the GFS model forecasts the shearing pattern to change somewhat in the tropical Atlantic but that isn’t until 10 days from now! At this point we are in the middle of September and beginning to get close to the time where storms developing out of the tropical Atlantic begin their development a little further west. The upper lows in the Atlantic are shown to be relaxing their grip at this point. The latest GFS model run recurves whatever is left of Grace well to the east of the Islands. Other models suggest a weak Grace will continue to move more westerly. Either way it does not look like Grace is going to be able to withstand this hostile environment barring a radical change in the atmospheric profile of the tropical Atlantic.